Finished chook house, with bunting to announce Grand Opening! Still got a sign to paint, but we can't make up our minds what to call it. Lots of good names on the internet: Cluckingham Palace, BuckingHEN Palace, Chook Manor, KFC Halfway House, Fowlty Towers, The Colonel's (Sanders) Castle, The Rooster's Residence and Hen House, and so on.. 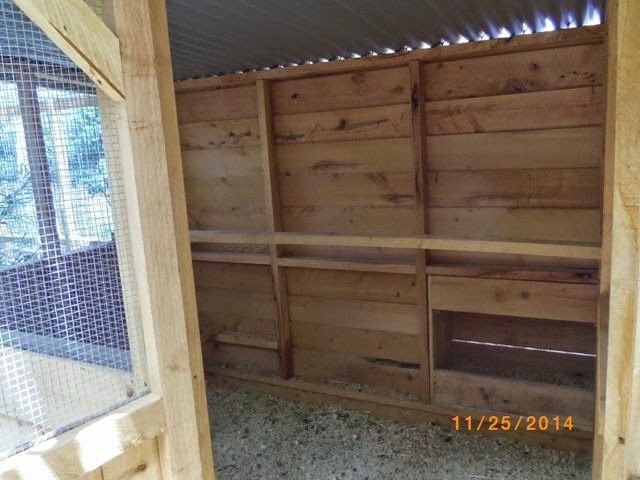 The Bed room aka chicken coop. On the right is the nest box which can be accessed from the front for us to take the eggs, instead of having to go inside the pen to get them. 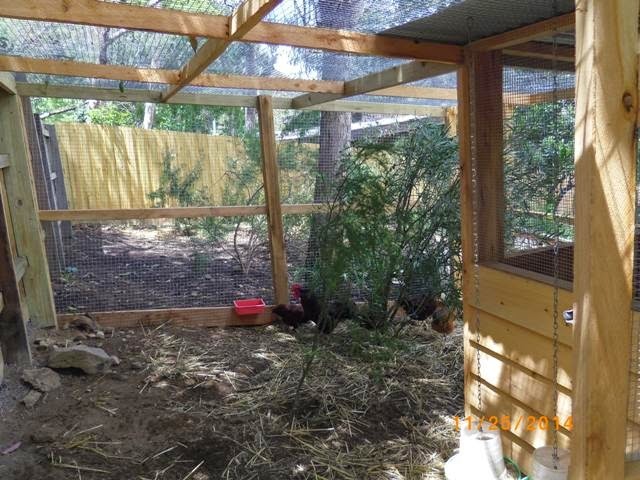 Taken from behind the coop, showing the top of the pen, which lets the light and rain in as well as protecting the chooks from any predators. Lots of straw and rocks for them to scratch around and find insects. 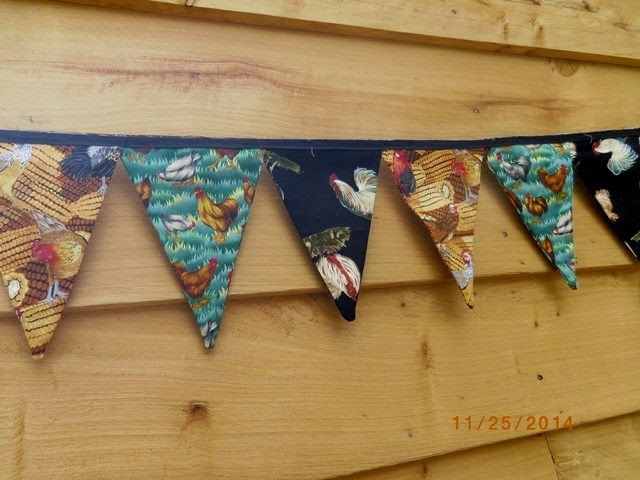 I made the bunting from scraps of chicken themed fabrics. 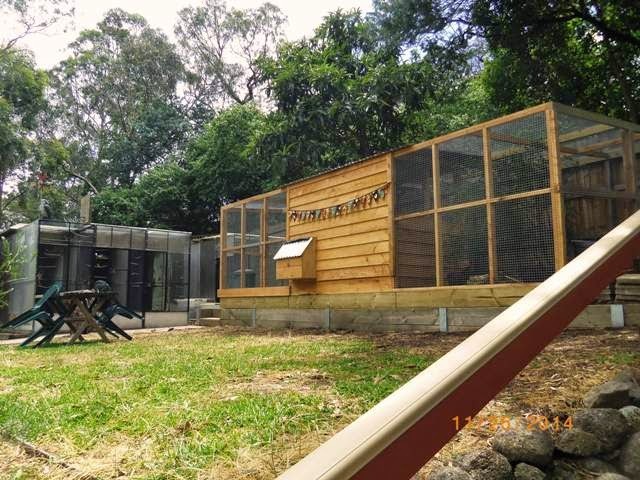 You can see how big the chook house is in comparison to the finch aviaries over in the corner of the yard. 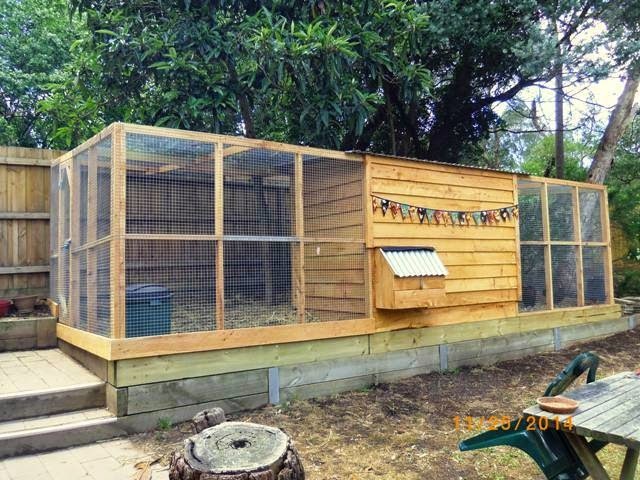 Nice place for the chooks - they'll be living in style! Love the bunting, too. So, for a Grand Opening there will be free treats? Door prizes? Don't forget balloons, too. LOL! LOL! Well I was thinking of giving some fresh eggs to the guests. Balloons are a thought, but the neighbours kids might want to prick them and scare the birds, so I don't think I'll do balloons.. I love the bunting and some of the names, though not the ones suggesting that the hens are destined for the pot! Think of their feelings, do. But then, I'm a vegetarian and rather wimpish.